For the better part of the year, a dark colored tarp has covered the exterior of the El Dorado, a 1913 building at 416 Spring Street. This morning, the tarp came down and the dismantling of the scaffolding began. 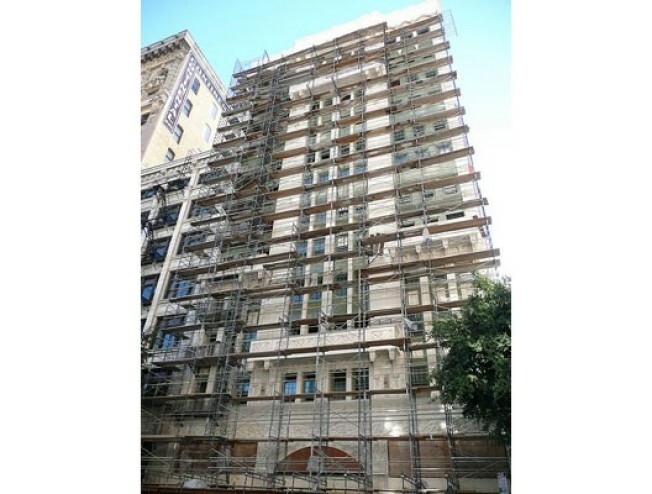 Originally known as the Hotel Stowell, the building--which is being converted in 66 condos--was built in a hybrid of Gothic and Art Nouveau styles, according to the web site of project architect Rockefeller Partners. With the tarp down, the floral terra cotta detailing is now evident, as is the green tile work. Here's an undated shot of the building, showing how grimy and dirty it used to look. According to Ron Truglia, senior superintendent at City Constructors, red brick (that was ultimately painted green) was used to re-create the original green tiles, some of which had to be removed during the renovation. In the lobby and mezzanine, seen in the gallery, many of the original details--like the stained glass above the front door and the lobby floors--were preserved. According to Truglia, there's talk of putting a restaurant near the lobby or mezzanine space in the building, which should be completed sometime next year. Part II with photos of the residences to follow.